Neverwinter Nights: Witch's Wake is one of the three (premium) modules BioWare released on November 10, 2004. Like the other two modules, Witch's Wake requires version 1.64 of Neverwinter Nights, and like ShadowGuard, it requires the Shadows of Undrentide and Hordes of the Underdark expansion packs. But unique to itself is that Witch's Wake was available for free before BioWare (re-mastered) it and turned it into a premium module. So is this new version especially different from the old one? And is it good enough to make it worthwhile to buy the so-so ShadowGuard module, since it is only available as a throw-in for that 101 MB download? Keep reading to find out. 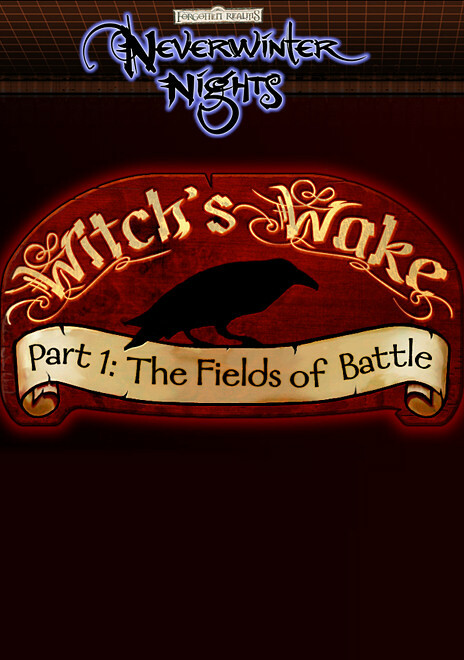 In Witch's Wake, you find yourself on a battlefield with no real memory of who you are or what's going on. You do remember your prince, but he lies dying at your side, and all he tells you in his last few moments is that you must (tell the king that she is dead.) Obviously, that's going to be a problem since you don't know who your king is, where his kingdom is located, or who (she) might be. But you gamely start on your mission, and along the way you deal with kobolds, zombies, and a mysterious woman called the Night Hag. Witch's Wake owes a certain amount to the game Planescape: Torment and the movie Memento. You don't know who to trust or who is telling the truth, and you don't know if the people you meet are just trying to use you, or if they are as loyal as they say. And then there's the Night Hag, who claims to have met you before, but who seems uncomfortable talking about that earlier meeting. Might she be the (she) who is supposed to be dead? The problem with Witch's Wake is that none of your questions are answered. This module is very clearly the opening act of a much larger campaign, and, as such, it's a little frustrating to go through 2-3 hours of set-up only to get no resolution, and to have the ending sort of spring up out of nowhere. At least ShadowGuard, which was also an introduction to something more, was self-contained, and the stopping point made sense. But playing Witch's Wake is sort of like only watching the first ten minutes of a movie, and who wants to do that, even if the movie is good? And so while I enjoyed parts of Witch's Wake (mostly the non-combat parts), and while I appreciated the amount of detail that went into it and the role-playing options that it gives, ultimately I found it to be a little frustrating. Hopefully in the future, if BioWare continues to release premium modules, they'll release full campaigns rather than chapters, or at least release self-contained modules (like Kingmaker). I'd just as soon not have to buy seven more episodes of Witch's Wake, one at a time, to see the whole thing. Finally, for those of you who played the original Witch's Wake and are wondering about the re-mastering, there are some minor changes throughout the module (such as being able to read some of the headstones in the cemetery), but mostly the improvements come down to two things. The first is the addition of a narrator for the module. That doesn't sound like a whole lot, but the voice actor, April Banigan, does a terrific job with her lines, and she really helps to bring the module to life. She's also the reason I'm giving the module such a high score for (sound & music.) The other improvement involves adding sub-races to the module (like nomad elves and cairn dwarves). However, given the nature and length of the module, this change, while intriguing, probably won't make much of a difference until we get to see the whole campaign.